German Pascual's was born in Uruguay, South America but was raised in Brazil and then moved to Stockholm, Sweden in his early teens and is still there today. German came to know Christian Liljegren(Narnia, Divinefire, Golden Resurrection). Christian allowed German to do the Vocals on the last Narnia album "Course of a Generation" Which was released in 2009. That same year, Pascual was named "The Best Metal Voice" by "The Gates of Metal." German first got my attention with his co-vocal duties with Liljegren on Divinefire's album "Eye of the Storm." On German Pascual's 2012 release "A New Beginning," what we have is some of the finest hard hitting Power Metal to be had. Most bands. on their first release, usually find that they have a lot of work to do but not so with German's first. You will think that you are listening to his third of fourth album because it's just that good. Production is first class with the instruments in there proper places in the mix. I also like that the vocals are placed nicely in the mix so we can hear and understand the lyrics. There are some musical moments that remind me of Devinefire and even some vocal moments that are similar between German and Christian mainly due to their working together. But make no mistake, German is no Liljegren clone because he has a unique voice and already has made a mark for himself. The Guitar work of Martin Hall, Carl Grimmark, Jani Stefanovic, and Thomas Johansson, makes for a wall of Heavy, Crunchy guitar shredding, the kind that is so thick that it sticks to your ribs. Some of the songs even have some Thrash riffs going on. 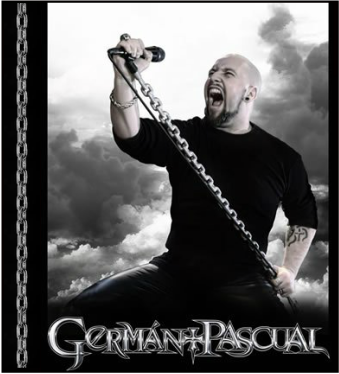 Pascual's vocals are second to none as he shows alot of control and power, German has earned a spot up with the best up there with Rob Rock and Les Carlson(Bloodgood). Pascual shows alot of versatility and strength when he goes from gritty to smooth soaring vocals like in the song "The Sky Would Fall." "If the Sky Would Fall"
Are you prepared to seek the truth? Pascual's album "A New beginning" is a solid debut release and has found its way into my stereo more often than others due to its melodic nature, This album comes with the highest of recommendations and is a must for all Metal Heads.